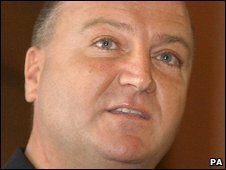 The left-wing No2EU party led by the leader of RMT rail union Bob Crow has gained 1% of the UK vote in the European Parliament elections. The No2EU - Yes to Democracy alliance polled 153,236 votes. The party's leader, Bob Crow, blamed the BNP's electoral success on the collapse of the main political parties. He called for urgent talks between socialist organisations and trade unions to build a concerted political and industrial response to the results. Mr Crow said: "There is no question that the BNP has benefited from the collapse of the establishment political parties and from media coverage that has pumped them up." He said sections of the press were also to blame for the BNP's success by giving it "blanket coverage". He added: "But it's the collapse of public support for the three main parties - each of which is pro-business, pro-EU and supportive of the anti-union laws - which has created the conditions for the scapegoat-politics of the BNP to thrive. "The fascists' support in former mining communities like Barnsley is shocking and throws down a massive challenge to the Labour and trade union movement." The party, had said if it were elected, its MEPs would refuse to take their seats in the the European Parliament in protest at the institution's "undemocratic" nature.